I created this card using the Leaf All Your Cares Behind digi set from Dee Dee’s Digis. Isn’t he a happy fellow? I decided to make this into a shaker card. I cut out his torso using an exacto knife and then taking a sharpie ran it around the cut edge to cover up any white showing from the cut. The sentiment is from the set. I have until midnight to link it up to the digi blog (nothing like waiting til the last minute). I am also linking this up to Send A Smile 4 Kids and to Fabulous Fuse Tool Ideas on Facebook. Here is a close up of the shaker part. I am happy with how this turned out and answered a question for myself. Can I use a digi image to make a Shaker Card? Why yes I can! What a great idea! When I saw your card, I did a mental “head slap!” Why not cut out a section for a shaker card! Brilliant! Thanks for joining us at the Deedee’s Digis DOM and hope to see your wonderful creativity every month! You are SO clever!! I don’t know how to make a shaker card from a digi image, but I LOVE how this turned out! 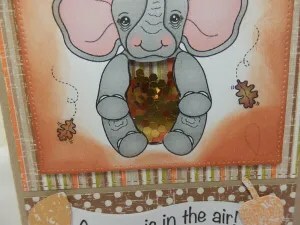 That elephant’s belly is filled with autumn-colored shakers that make him even more adorable than he was before! Brilliant idea for a card, and thanks for playing along with Deedee’s September challenge!